On August 28th, 1917, in New York City’s rough-and tumble Lower East Side, the most visionary and significant artistic innovator of the 20th — and, so far, the 21st — century was born. I say that without a hint of hyperbole, exaggeration or, even more appallingly, irony, because the boy that Rose and Benjamin Kurtzberg named Jacob (or, in their native Hebrew, Ya’akov) went on to shape modern popular culture — and, by extension, culture as a whole — more than anyone else you can name. And speaking of names — he had many, in addition to the one written on his birth certificate. Some called him Jolly. 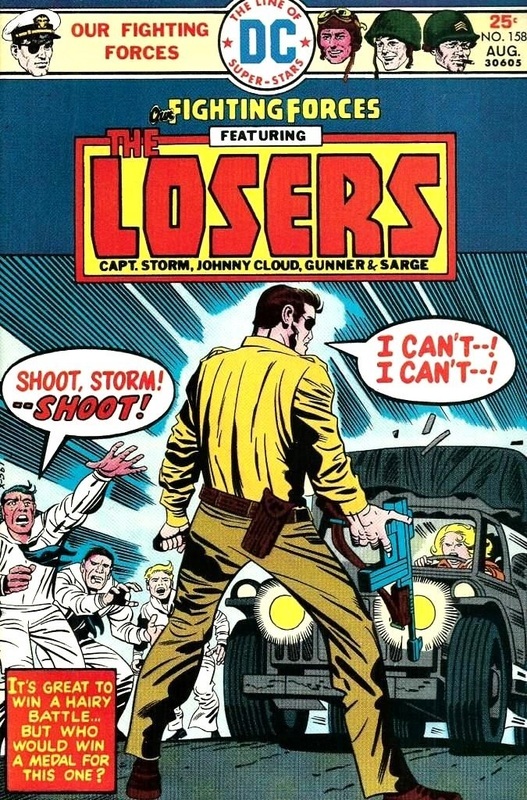 Some called him The King Of Comics. Some shortened that to simply “King.” Early in his career he experimented with nom de plumes such as Fred Sande, Curt Davis, Jack Curtiss, and Ted Grey, among others. 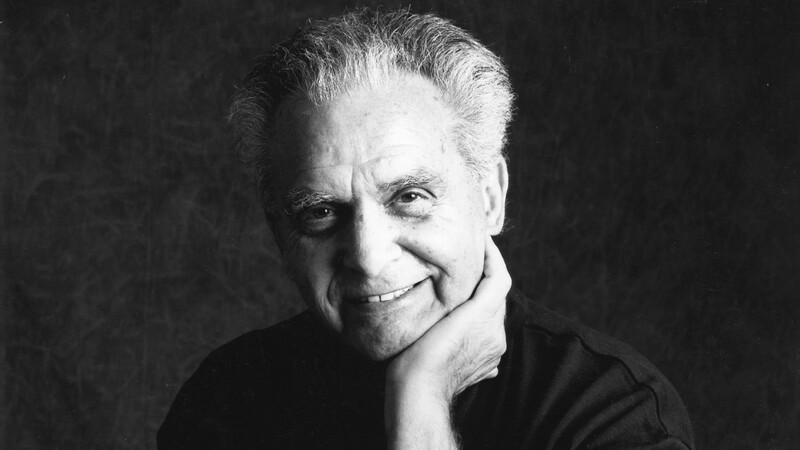 But the “handle” by which he is best known is the professional moniker that he stuck with, the one that would adorn all of his monumental works in the decades to come, the one that would eventually be engraved on his tombstone — Jack Kirby. 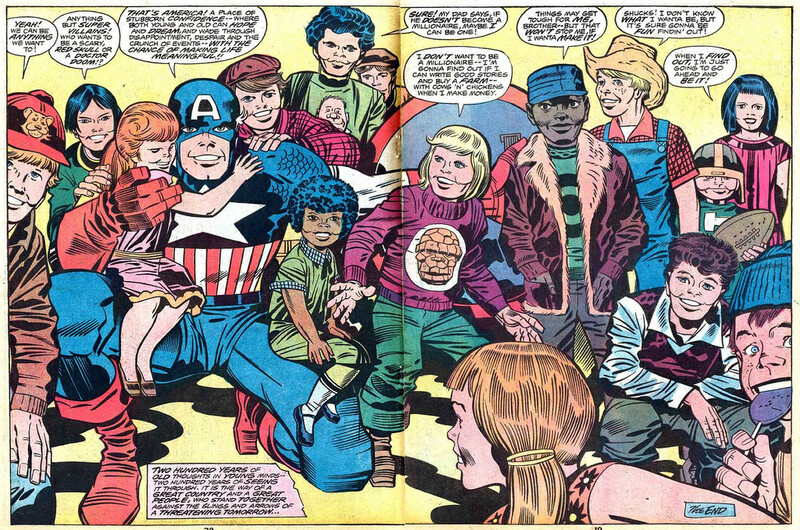 If you love it, odds are better than good Jack created it : Captain America. The Fantastic Four. The Hulk. Thor. Iron Man. Black Panther. The Avengers. The X-Men. The Silver Surfer. The Inhumans. 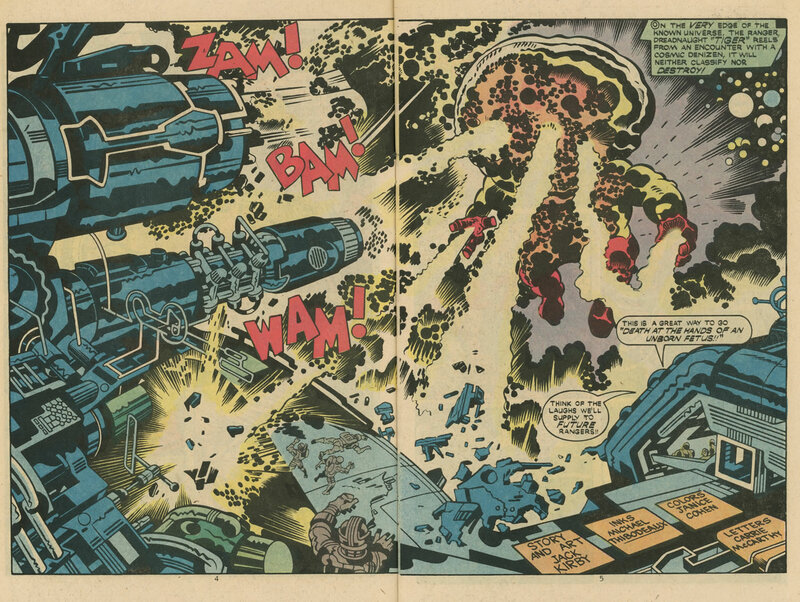 Doctor Doom. Magneto. 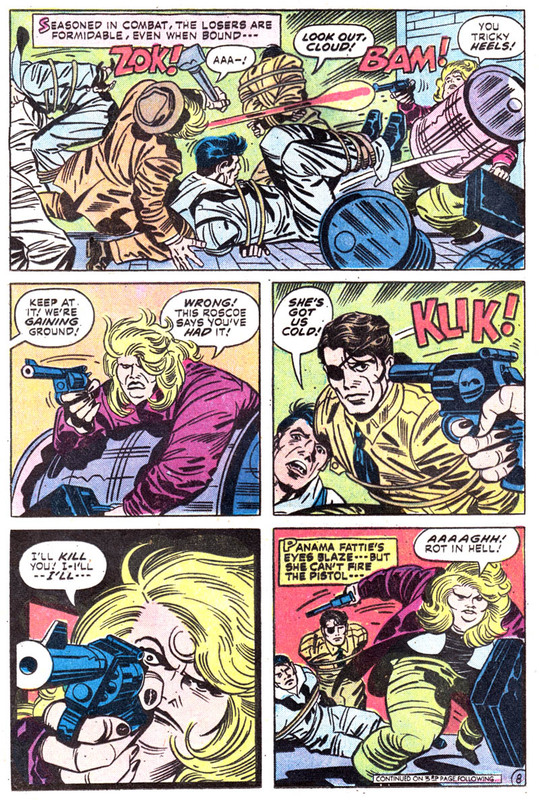 Nick Fury and S.H.I.E.L.D. 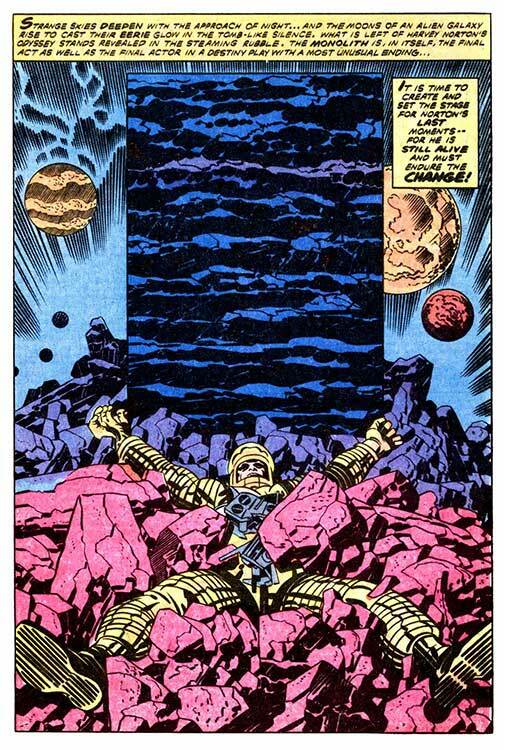 Galactus. 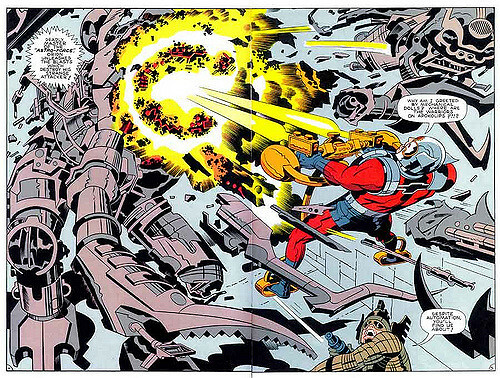 Darkseid and The New Gods. 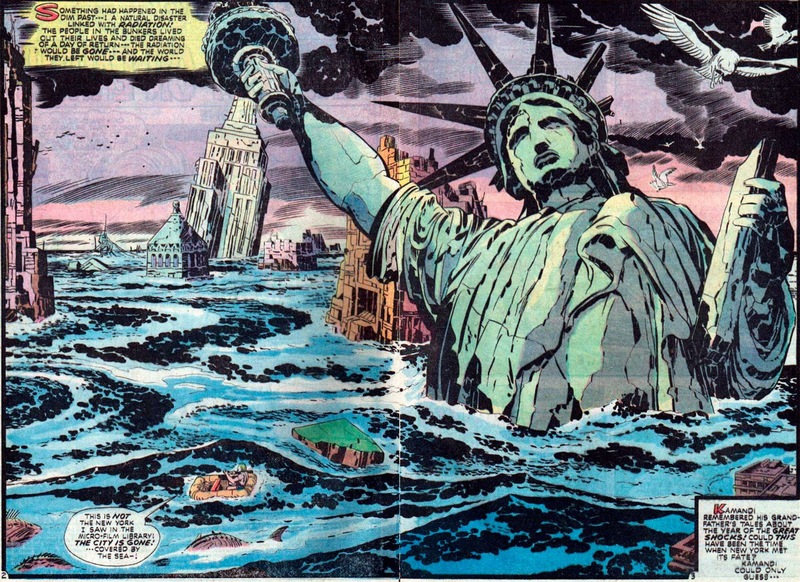 Kamandi. The Demon. 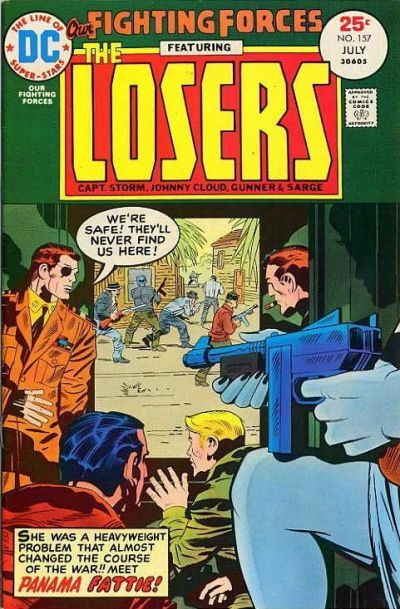 The Newsboy Legion. The entire romance comics genre. And all this? It’s only the tip of the iceberg. 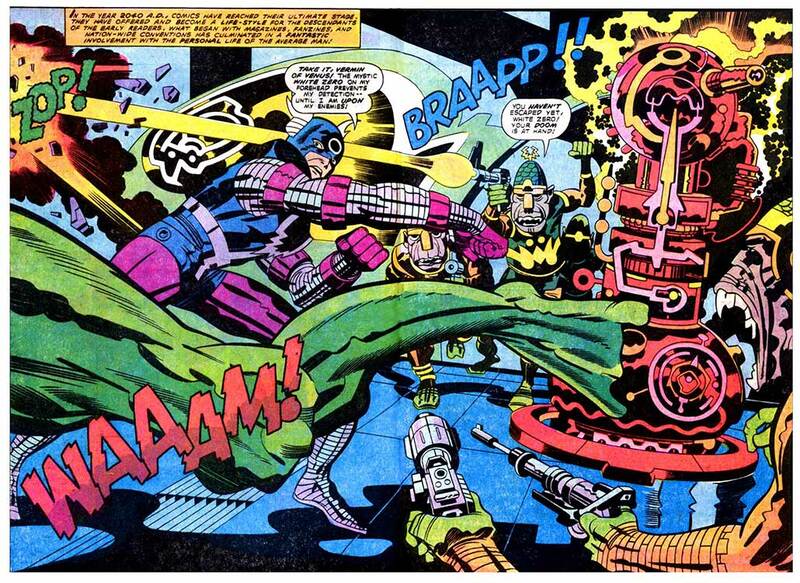 Jack Kirby created characters as effortlessly as most people concoct excuses. He was literally a non-stop idea generator. And his ideas stuck. The overwhelming majority of them have not only stood the test of time, they’ve gone on to earn billions. What is cynically called “intellectual property” these days? Most of it came from one man’s intellect. Here’s the damndest part of all, though — he never slowed down. Never stopped. Innovation was in his blood. He may not have created the comic book. He may not have created the super-hero. But he re-created both so many times that they would be unrecognizable today, if not extinct altogether, were it not for him. And with each successive project he undertook, he went bigger. Bolder. Challenging himself to push beyond what he’d done before, and to re-shape not only his readers’ expectations, but their perceptions. 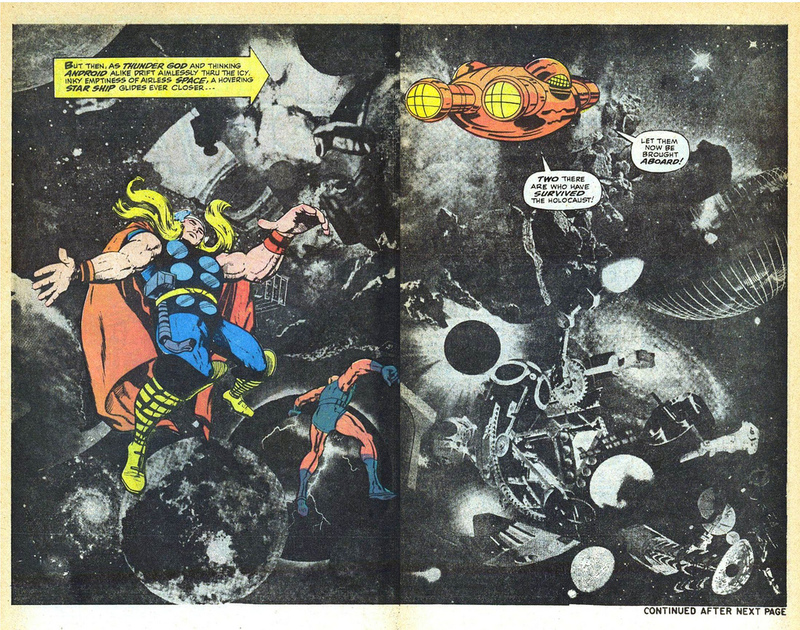 No less an authority than Grant Morrison has called Kirby “the William Blake of the 20th century.” The comparison is apt. 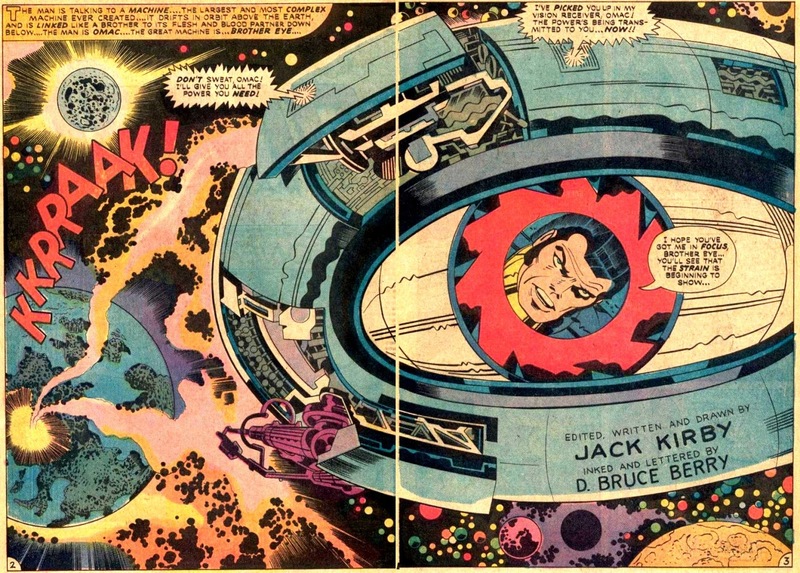 Like Blake, Kirby seemed attuned to something beyond that he was able to translate into the immediately recognizable. 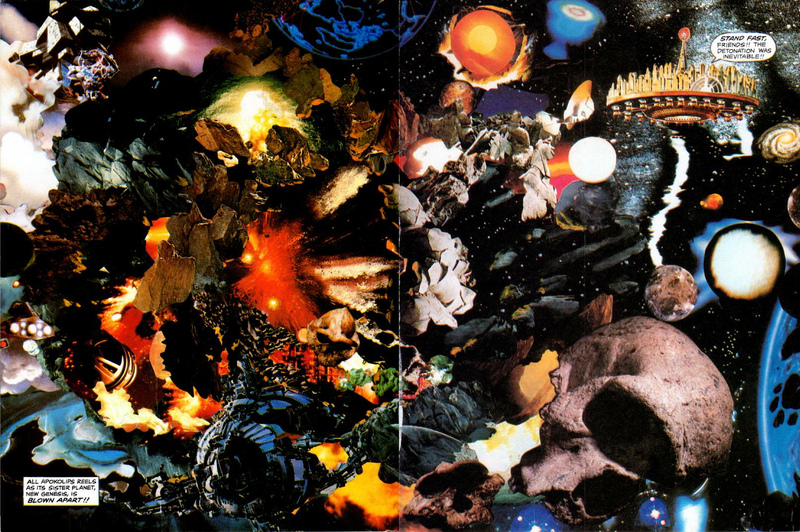 He filtered complex thought-forms into visionary illustrations and stories that were both mythic in scope and human in scale. The universe of the imagination was his playground, and he not only went to worlds far beyond our own, he invented them. Time and time again. Look beyond comics for a minute and consider films. 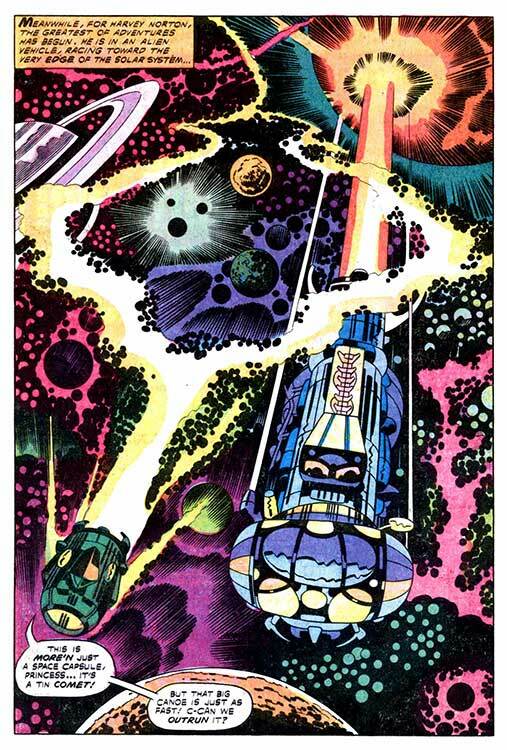 Consider that Jack Kirby gave us “The Source” and Orion being Darkseid’s son before George Lucas gave us “The Force” and Luke Skywalker being the progeny of Darth Vader. 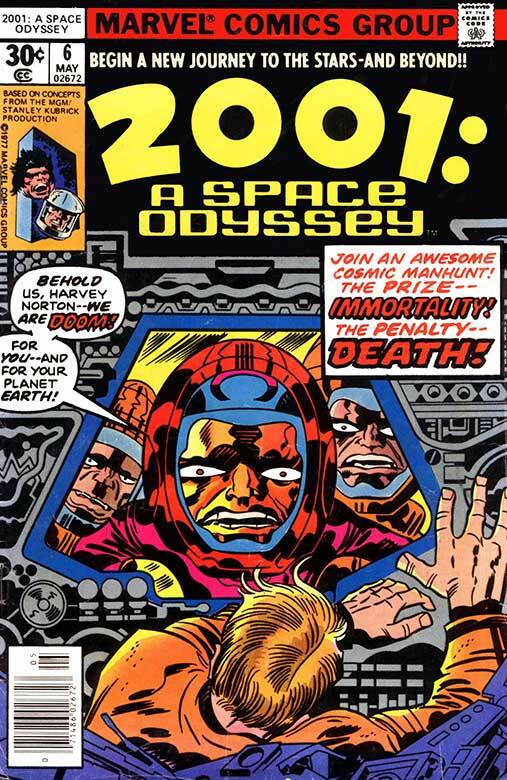 Ask yourself if the concept of the “blockbuster” film as we’ve come to know it would exist if not for Kirby. 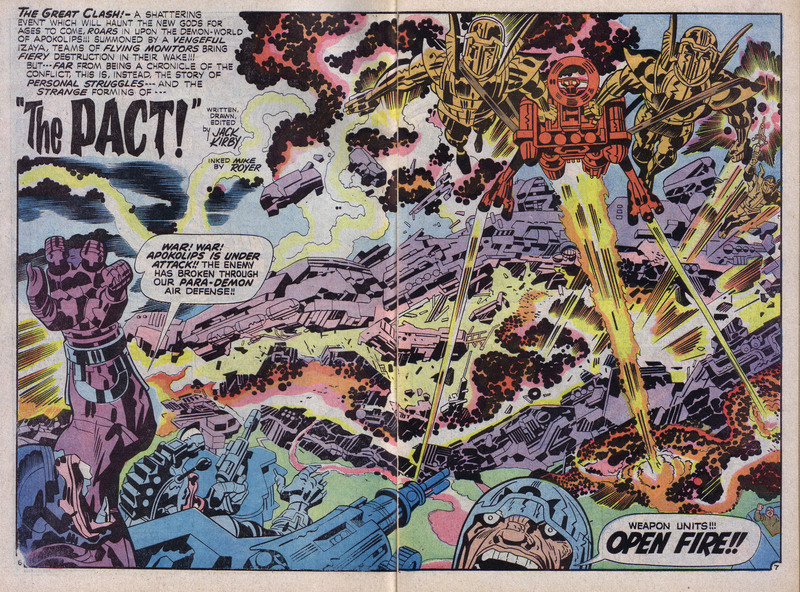 The scale, the magnitude, the grandeur of the multi-million-dollar Hollywood production — Kirby did it all on the printed page first. How about video games? Today’s “POV” and “multi-player/interactive” games all put the action right up “in your face.” Who was the first person to introduce that perspective? To put the consumer right in the middle of the action and “see” things from their vantage point before he put pencil to paper? You got it. 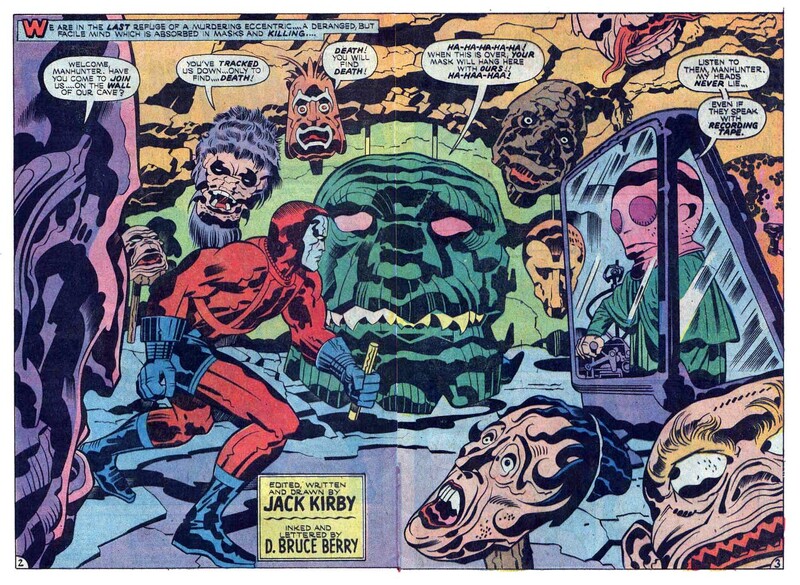 To drag things back to the medium that Kirby not only operated in and excelled at but flat-out owned, there are entire artistic tropes that he devised from whole-cloth and that remain entirely his as surely as the label “King Of Comics” does and always will : “Kirby Krackle.” “Kirby Tech.” “Kirby Collage.” All these are spoken of not only with awe, but with reverence. There’s nothing else like ’em. There never will be. 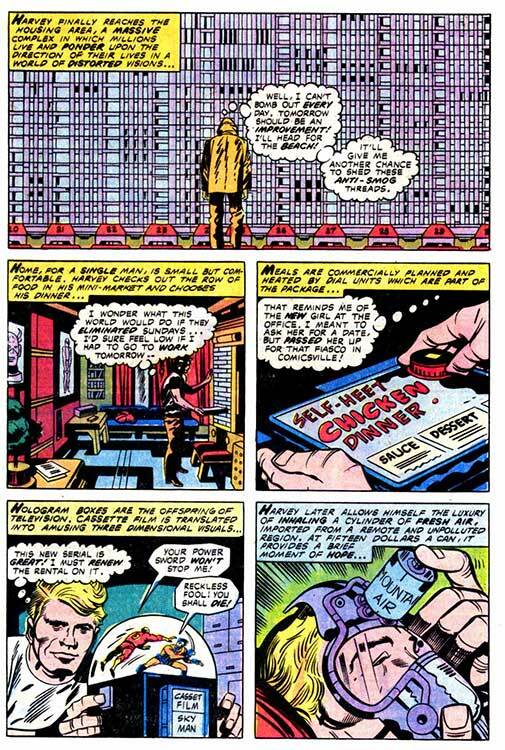 Let me add one more innovation to the list that The King never gets enough credit for — “Kirby Dialogue.” It was singular. It was, appropriately, mythic. It was as unconventional as his art — and every bit as effective. It contained, and communicated, entire universes of meaning. It was magnificent, in the strictest dictionary definition of that word. What could motivate one man to do all this — to reach for the stars and bring them down to the rest of us day in, day out? How about love. Kirby was never too proud to admit that he was, at the end of the day, a worker. And he took pride in how hard he worked for the best and most noble reason of all — he was doing it to put food on the table. To provide a better future for his wife, Roz, and their four kids. Sure, he wanted to keep us glued to the page — but he did so in order to provide for them. Intentions don’t come any more pure than that. 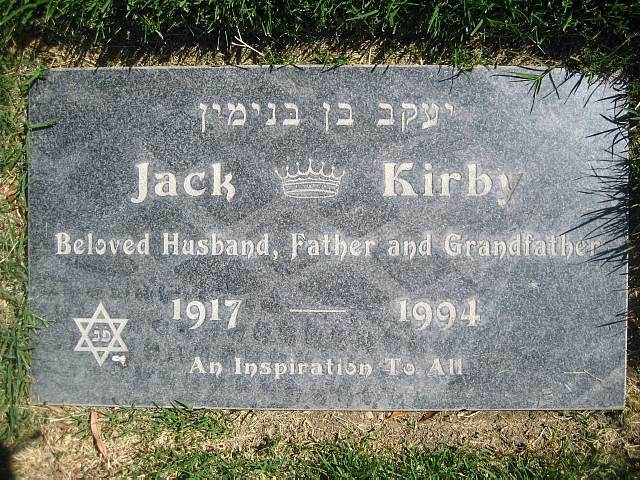 Jack also served his country in the European Theater in WWII. 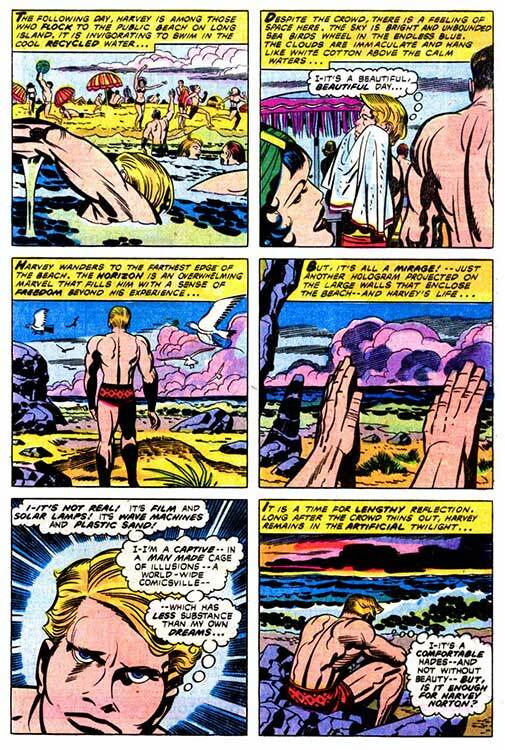 Those experiences, as well as his hard-scrabble upbringing, frequently made their way on to the pages he wrote and drew, and that leads to yet another point I want to make : for much-larger-than-life modern mythology, the entire Kirby canon is, in all ways and at all times, a highly personal one. 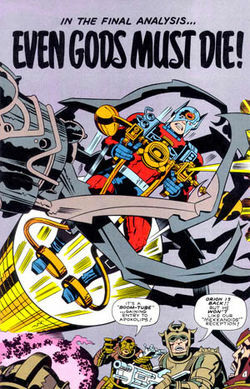 There’s more than virtuoso artistry and dynamic scripting in every Jack Kirby comic, there’s a hell of a lot of heart and soul. 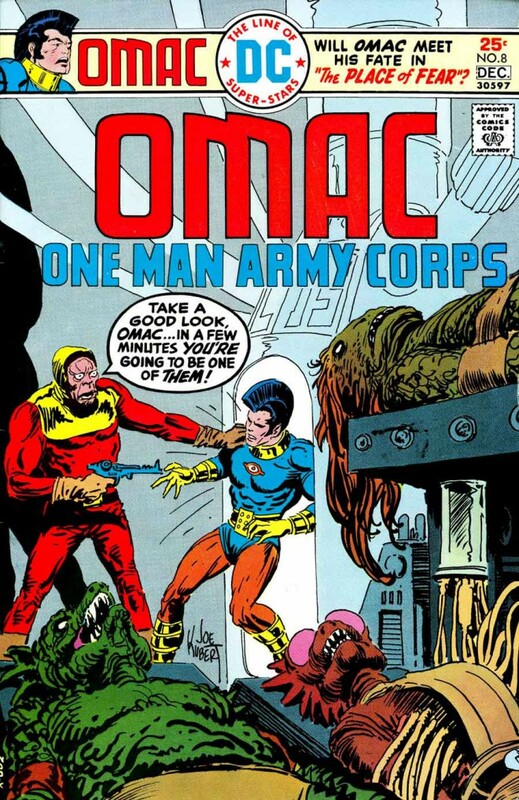 His work speaks to us all on a core level in a way no other comic-book creator has ever been able to duplicate — and trust me when I say, they’ve all tried. 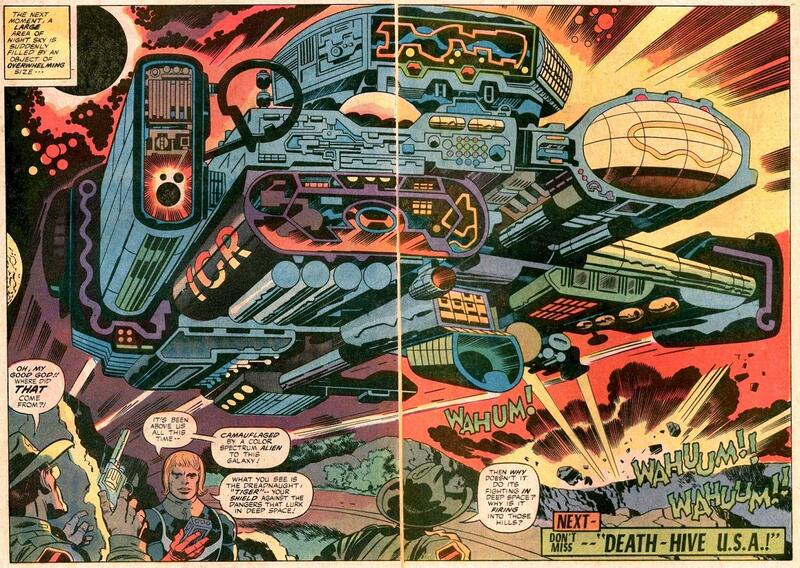 In the coming years, we’ll be hearing more about Jack Kirby than ever. The power of his imagination, having been tapped by the Marvel/Disney bean-counters and suits for well over a decade at the box office, is about to bear lucrative financial fruit for DC/Warner, as well — Darkseid, and the rest of the Fourth World characters, are about to take center-stage in the so-called “DCEU” in a big way. Residuals, which hopefully his heirs won’t have to fight tooth-and-nail for as they spent decades doing with the so-called “House Of Ideas,” should be enough to help guarantee them all a comfortable retirement. Yup, even 23 years after his passing at the age of 76, The King is still providing for his family — and something tells me that if he’s looking down on this world, that fact makes him proudest of all. As for everything else going on down here on the mortal plane? 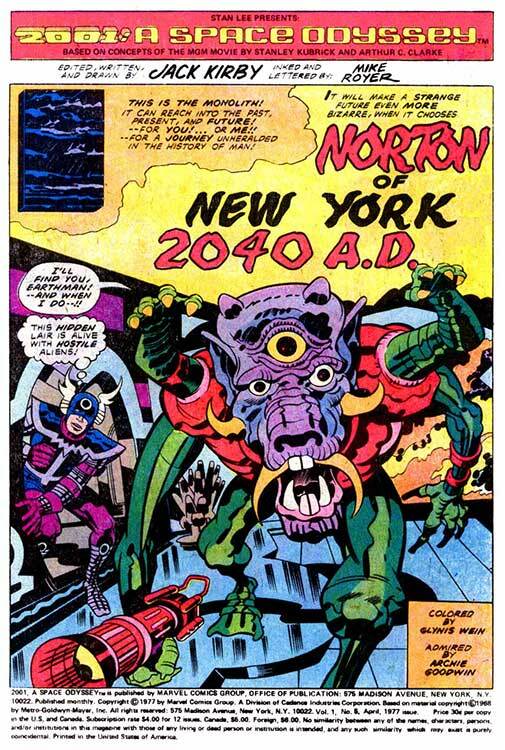 Kirby saw it coming. Streaming entertainment, consumerist gluttony, pointless war, clashes of ideals, global communication, even Donald effing Trump — all predicted, often with uncanny accuracy, in the pages of his books. The King was a product of his times, without question — but he was also, and always, a few steps ahead of them. That depressingly-overused “genius” label that now gets applied to anyone who writes a half-decent novel or makes a watchable film? It’s actually too small in this instance. And so the legacy of this great man is destined to continue on, for as long as there are ideals to aspire to and children (and grown-ups) to dream. 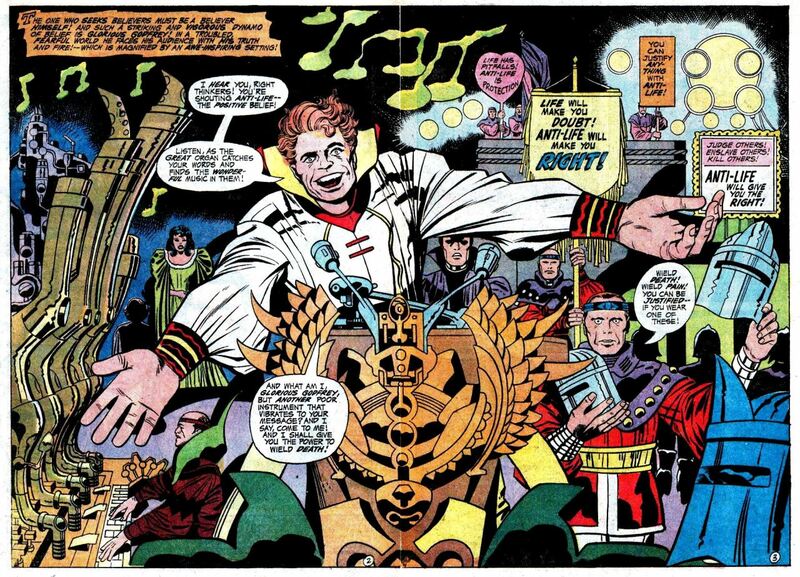 For all the turmoil Kirby foresaw in the times ahead, his work always retained an essential and irreducible optimism — a belief that the human spirit would not only endure, but triumph. If you were to ask me to name a more aspirational, and inspirational, artist, I couldn’t do it. But Jack did a lot more than hope for the best from us — he was the best of us. 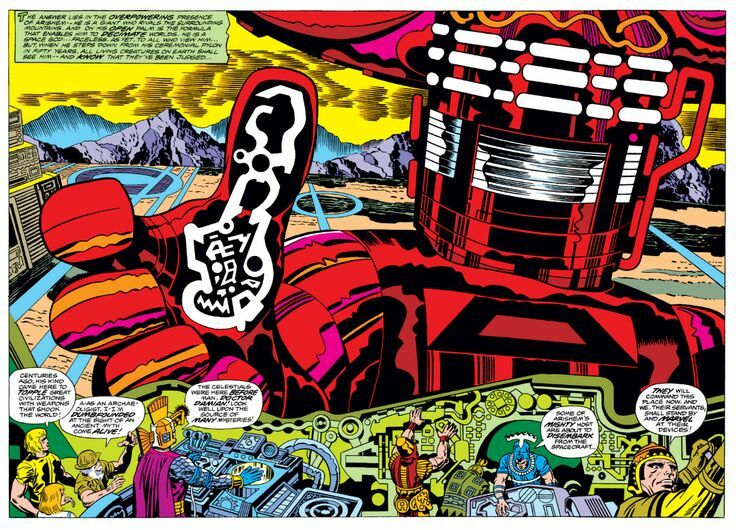 You’ve gotta hand it to Jack Kirby — if you or I had been toiling away in the comic-book industry for approximately four decades, only to have our major life’s work strangled in the proverbial crib, we would probably give up on the whole notion of the “sprawling cosmic epic” altogether and just stick with simple stand-alone stories, punctuated by the occasional two-or-three-parter, until it came time to hang up our pencils and call it a career. Who needs the disappointment of early cancellation all over again? 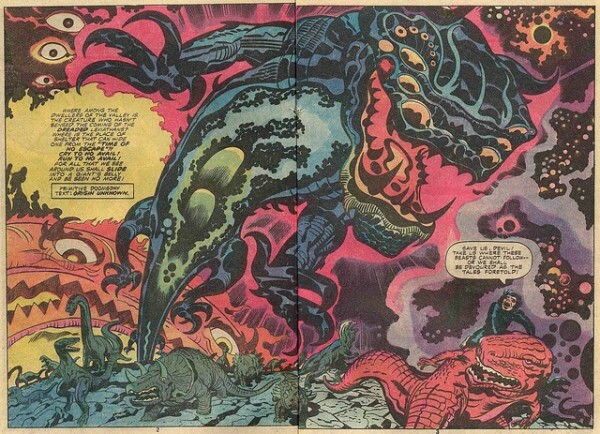 When Kirby returned to Marvel at the tail end of 1975, he was ready to reach for the stars again, and while he would (apparently somewhat reluctantly) return to famous characters he’d created like Captain America and the Black Panther, the project that he was most excited about was his next “high-concept” science fiction masterpiece-in-the-making, originally entitled “The Celestials” and then “Return Of The Gods” before making its July, 1976 cover-dated debut as The Eternals. 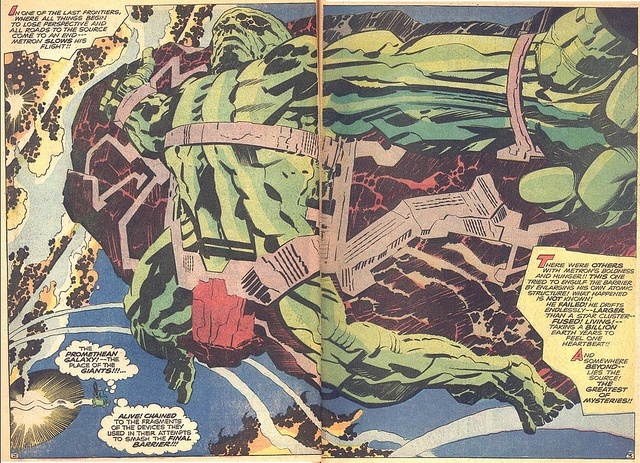 Right off the bat in this first story, titled “The Day Of The Gods,” it’s clear that Kirby is playing a “long game” here : incorporating then-popular elements of the cultural zeitgeist such as the purported “sunken kingdoms” of Atlantis, Lemuria, Mu, and the like; mysterious “vanishing zones” such as the Bermuda Triangle; and, most especially, the “ancient astronauts” theories popularized by the dubious-at-best Erich Von Daniken, this debut issue is all about setting a vast and ambitious stage for itself encompassing not only all of human history, but the histories of two purported “sibling races,” as well — the genetically-and-morally-challenged Deviants, and the titular and quasi-godlike Eternals. 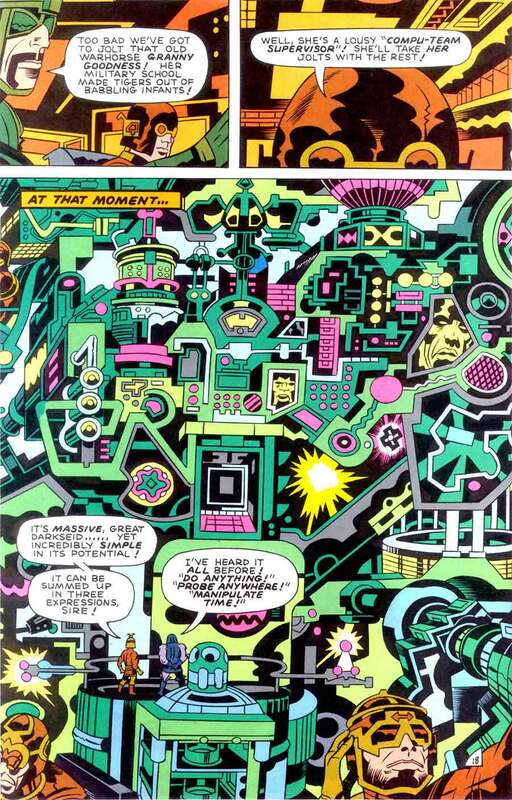 Most of the principal characters we’d come to know over the course of the book’s run aren’t even introduced in these pages, so dense and complex is the task of “world-building” that Kirby has set for himself, but it almost doesn’t even matter in the scheme of things — this isn’t so much the “ground floor” of something big as it is its foundation. 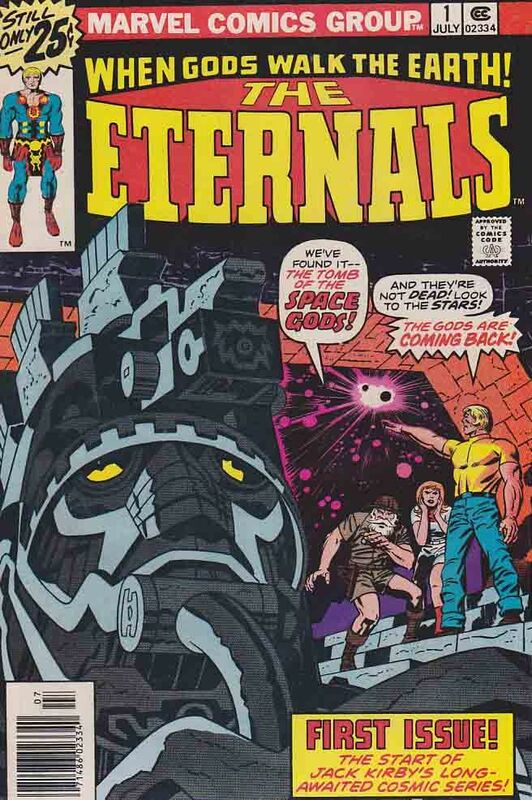 Sure, we get to meet Ikaris (albeit in his thinly-disguised “civilian identity” of Ike Harris) as well as archaeologist Doctor Damian and his fetching daughter/assistant, Margo, who would go on to become semi-important supporting players, but on the whole this is one big old info-dump. Why, then, is it so endlessly fascinating and eminently readable, even after all these years? 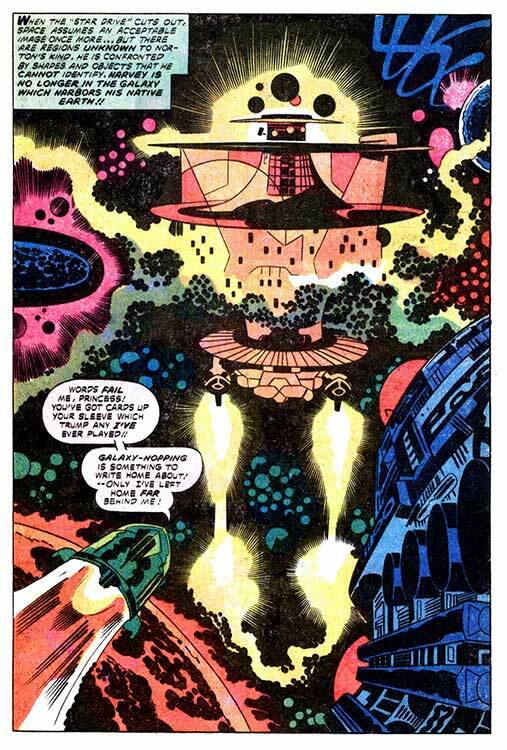 A lot of it is down to Kirby’s genius pacing — despite its heavy reliance on Ikaris’ lengthy “here’s all you need to know before we begin” monologue, there is a clear and present danger hanging, Sword- of- Damocles-style, over the proceedings here, and before we even see a single Celestial (which doesn’t happen in this issue, in case you were wondering), the senses-shaking prospect of their imminent return is established as something larger and more profound than our mere mortal minds can process —and Kirby communicates it all with such vital urgency that there’s no mistaking the import of what’s about to happen, even if it doesn’t happen here. Seriously, though, I defy you not to be absolutely hooked on this comic by, oh, page four or five. 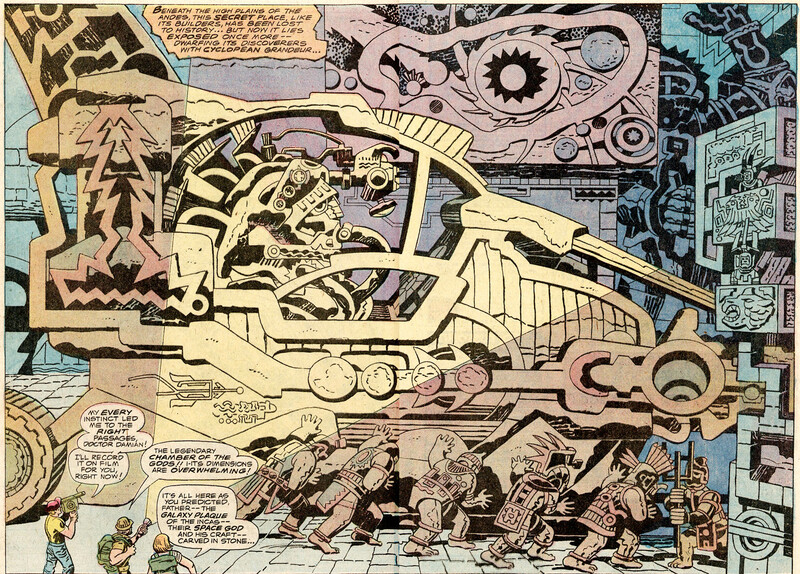 The art (masterfully aided and abetted by the heavy-but-faithful brush of John Verpoorten, for my money one of Kirby’s most underappreciated inkers) is absolutely killer, too — a heady stylistic mix of any number of various ancient cultures, particularly the Incas (who, along with the Aztecs, had long been a major influence on The King’s visual ethos), it nevertheless looks like something from several centuries into the future given its incorporation not only of all kinds of typically-awesome “Kirby Tech,” but of truly alien designs courtesy of the undersea realm of the Deviants. 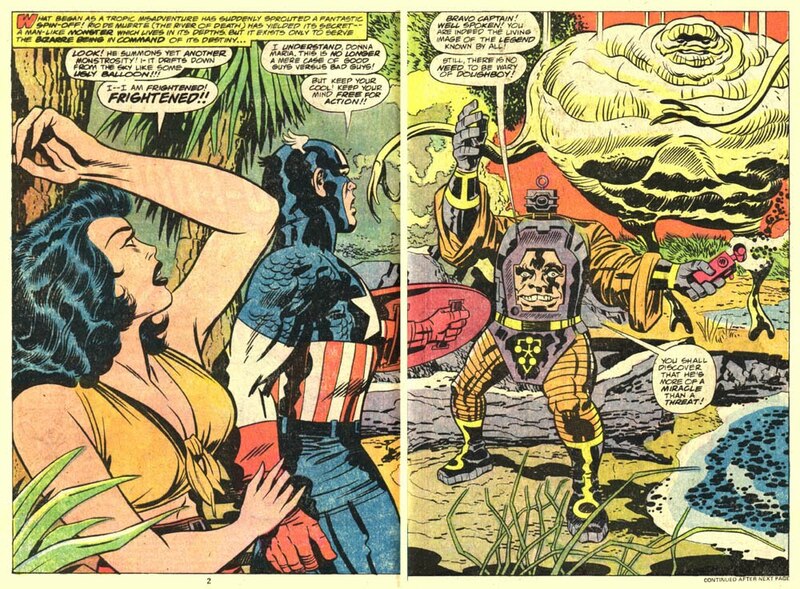 This may be a Marvel comic, sure, but it looks like something from a universe all its own — and indeed, such was Jack’s original intention, to the point that even when the company’s bean-counters handed down dictates to include guest appearances from The Thing and The Hulk, Kirby cleverly (and probably to the chagrin of said “superiors”) made certain they were only lame dopplegangers and not the “real” thing. After all, when you’re pouring this money concepts onto the page at once, tying yourself down to a pre-existing, inter-connected corporate “world” is only going to slow you down. 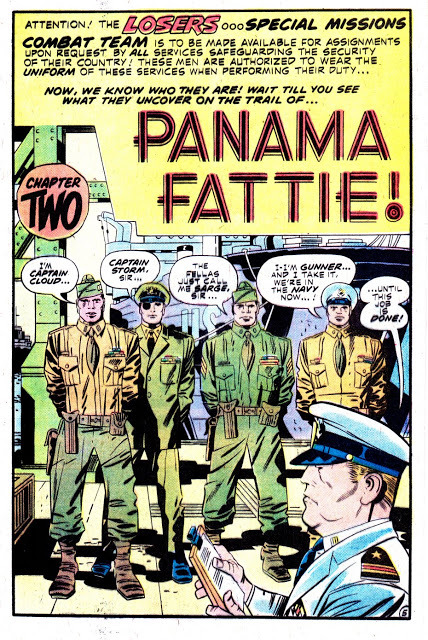 And if there’s one thing that this comic doesn’t do, even in this first issue that skirts the edges of “information overload,” it’s slow down — not even for a single second. 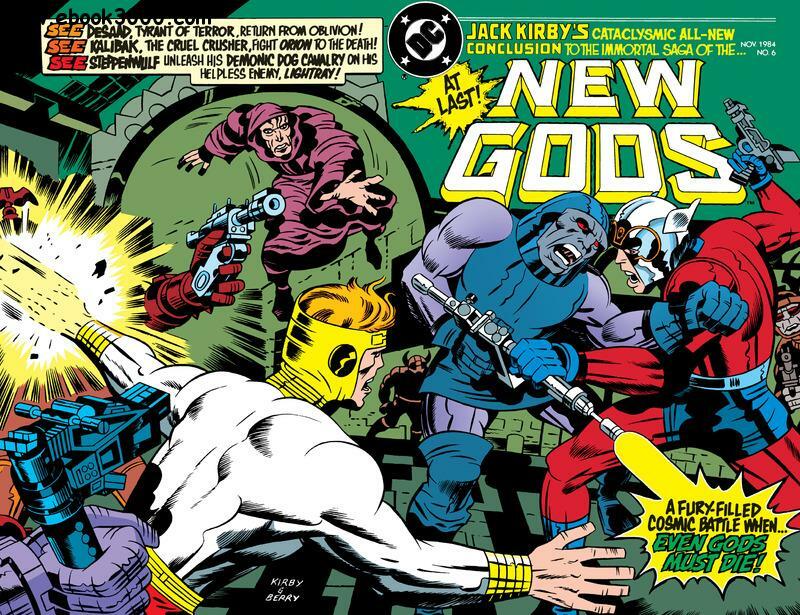 If you haven’t yet had the chance to read it, Marvel reissued it (complete with Mike Royer’s introduction from the series’ hardcover omnibus collection, two historical appraisals by Robert Greenberger written prior to Neil Gaiman and John Romita Jr.’s 2006 relaunch of the title, and three of Kirby’s original letter-column essays) this past Wednesday as part of their bargain-priced “True Believers” reprint line, and there’s probably no better comic on the new release racks this week than True Believers : The Eternals #1. This is brash, boisterous, and bold imagining that backs up its sound and thunder with super- charged lightning that hits its mark directly. I admit it —at first, I was planning on reviewing The Hunger Dogs as part of this “Kirby Month” series I’ve got going, but about halfway through writing that appraisal, it occurred to me that there were any number of fine essays devoted to that graphic novel available online already, and since one of my goals with this entire enterprise has been to shine a light on some of the lesser-discussed works in The King’s canon, I quickly decided to shift my attention elsewhere — although I’m not going that far away. 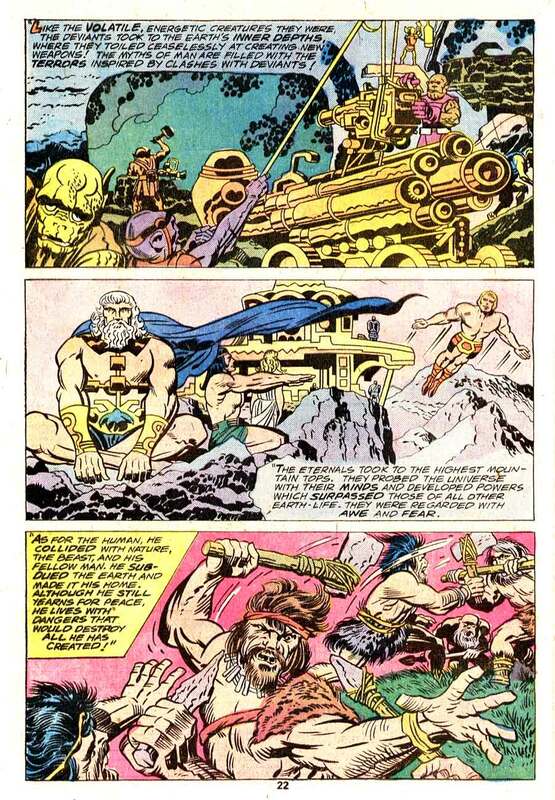 By way of explanation, in 1984, DC’s post-Carmine Infantino regime of Jenette Kahn and Paul Levitz brought Jack Kirby back into the fold in a big way, wisely deciding to finally allow him to “finish,” albeit in truncated form and after a lengthy hiatus, his legendary Fourth World epic. 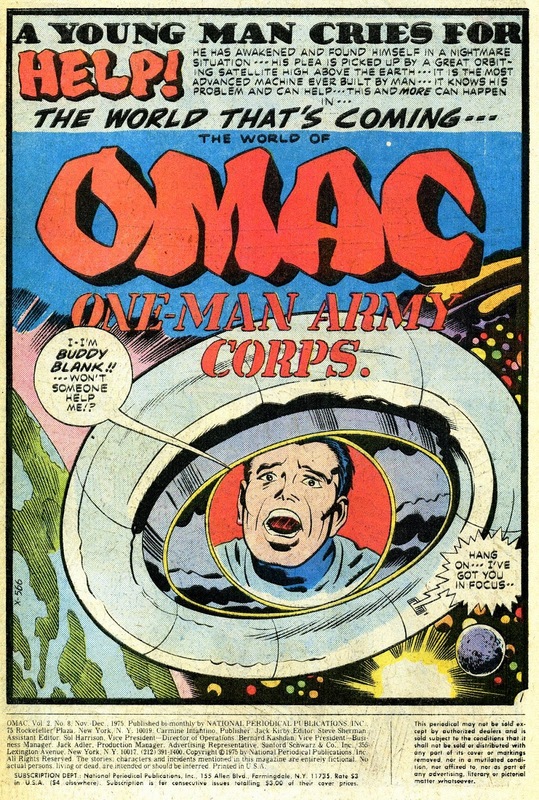 Right off the bat it was clear that whatever conclusion Kirby would be providing now would be both a) substantially different to what he had originally envisioned given that there were probably a couple hundred comics (at least) along the way to wrapping up the story that he never got the chance to do given the premature cancellation of the entire line a decade previously; and b) not really a “conclusion” at all since all the characters had firmly and irrevocably been “folded” into DC’s larger corporate “universe” by that point. 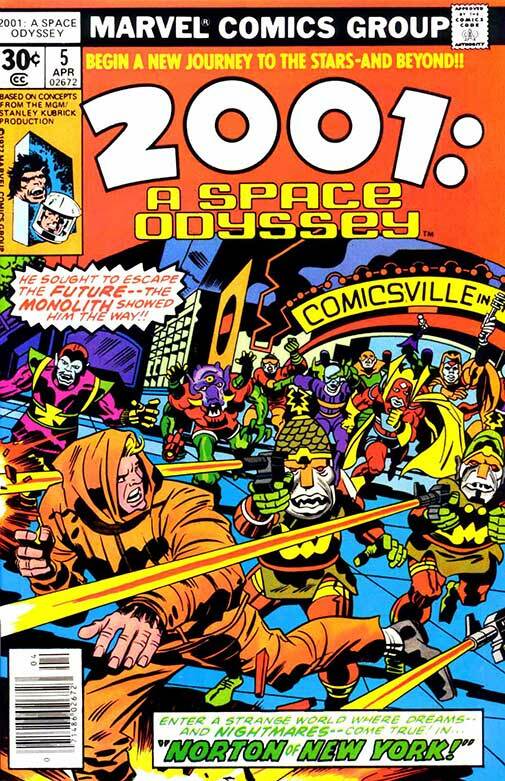 The big finale was going to come in the form of the previously-mentioned The Hunger Dogs, but prior to that, the entire 11-issue run of the original New Gods title was slated to be re-issued in a series of six deluxe-for-the-time monthly comics (featuring no ads, shiny white paper, and a then-high cover price of $2.50) as a lead-in to what was no doubt the comics event of the year. 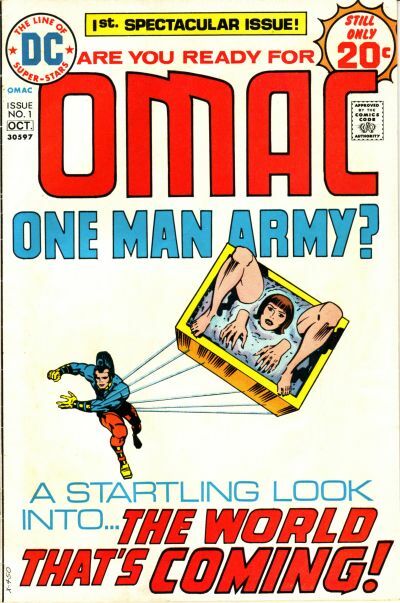 There was just one little wrinkle : the two-old-issues-per-one-new-issue publishing schedule meant that number six (cover-dated November, 1984) was going to come up short in its page count. What, then, to do? 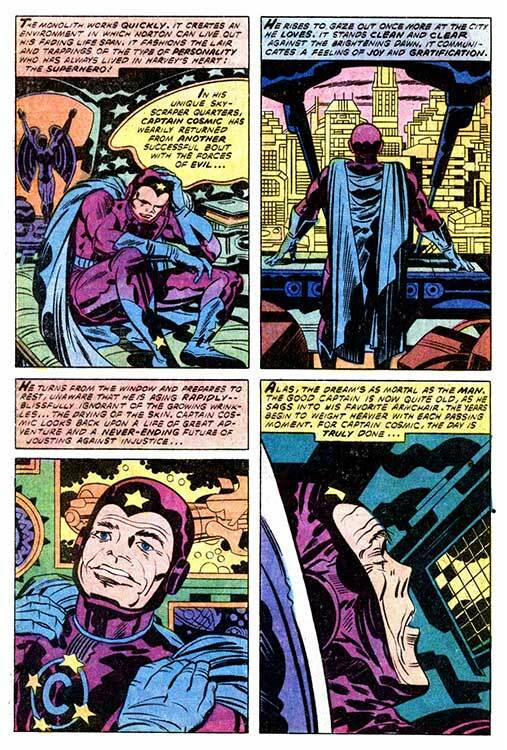 Well, why not turn the “back half” of that final book over to Kirby himself and let him tell a new story? And tell a new story he most certainly did — a 48-page story, in fact, that had something of a double editorial remit : it had to serve as a bridge between the “old stuff” and The Hunger Dogs, but it also had to serve as a suitable “ending” in and of itself for the readers who had been picking up the preceding issues but maybe couldn’t (since it wasn’t going to be available on newsstands) or wouldn’t (because six bucks was a lot of money back then) get the big, fancy graphic novel when it came out. And so “Even Gods Must Die!” was born. 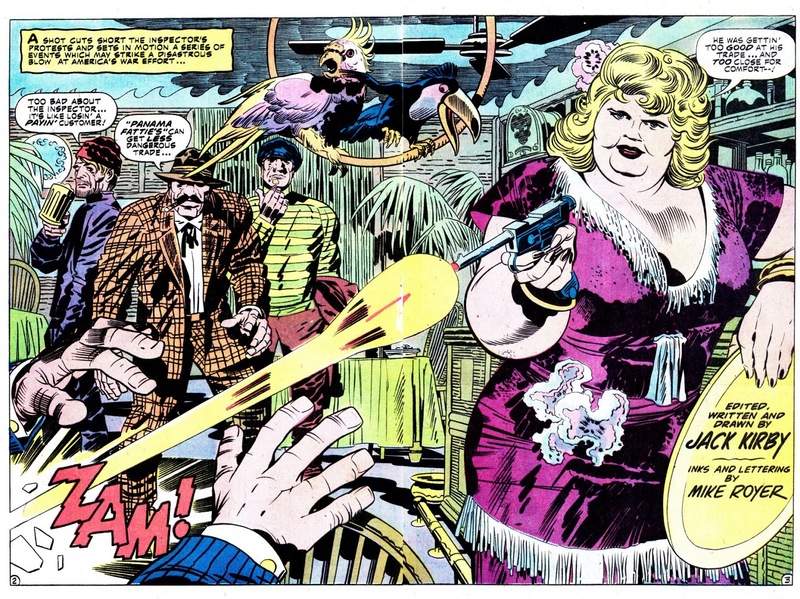 As most folks know, The Hunger Dogs had a convoluted gestation, originally being commissioned as a single-issue special carrying the title “On The Road To Armagetto” before being “fleshed out” (and mercilessly fucked with) into its final form, but from what I’ve been able to piece together, this late-in-the-game addition to the Fourth World mythos, while admittedly shoehorned into a (highly fluid, fair enough) pre-existing plan, came about at least a little bit more smoothly after it was commissioned, and frankly it does add quite a bit of depth to both what came before it and, crucially, what was to follow — but I’d be lying if I said that, on the margins at least, it didn’t belie a sign or two of being at least a little bit rushed . More on that in a moment. In addition to this lengthy list of attributes, the shocking ending to this tale really hits like a ton of bricks — don’t get me wrong, I’m a big fan of The Hunger Dogs (despite its handed-down-from-on-high flaws) and think it’s absolutely essential reading, but if the whole Fourth World thing had ended here, well — it would’ve worked. It would’ve ended (again, not that it was really ever going to “end” at this point) on an entirely different note, to be sure, but it would have been tonally, logically, and thematically appropriate for all that. Where, then, does my charge of this feeling “a little bit rushed” come from? 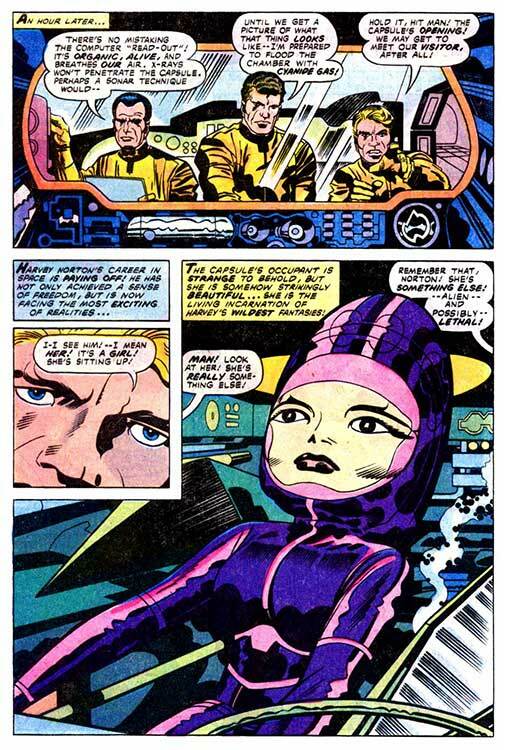 Well, I’m not sure when, or under what set of circumstances, veteran Kirby inker D. Bruce Berry was brought into the fold, but there are a number of instances here where he doesn’t seem to exactly be on his “A” game. 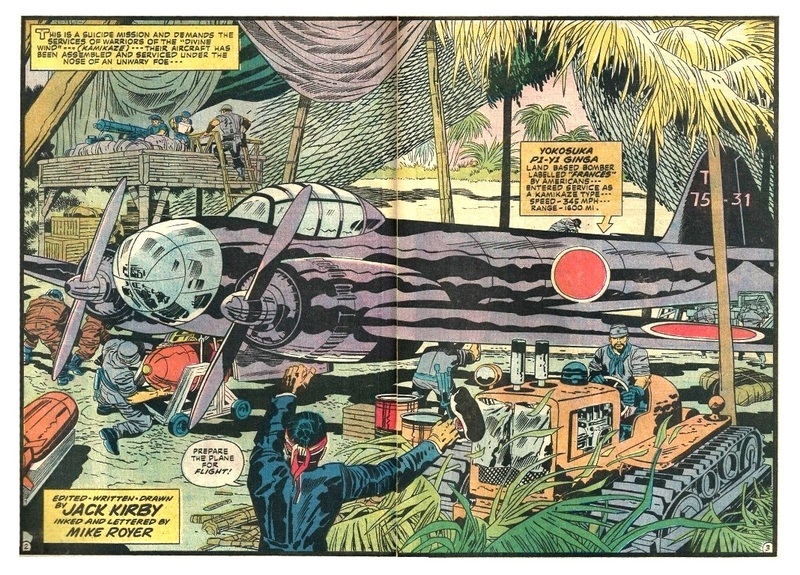 A number of pages — hell, most — look just fine, if somewhat less than inspired, but a handful of others clearly skimp on the details, cut corners on the backgrounds, and “dial back” a fair amount of Kirby’s masterful interplay of light and shadows. 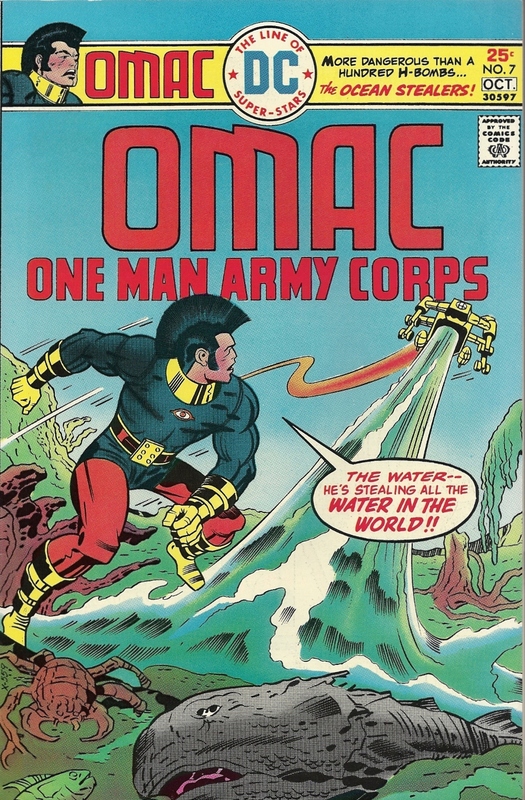 I can’t believe he’d do this intentionally given the fealty he usually showed toward Jack’s pencils (my mild criticisms of some of his OMAC work notwithstanding, he almost always did a solid job), so my best guess is that he may have come on board at the last minute — and hey, it could have been worse : DC editorial could have given the gig to Greg Theakston. 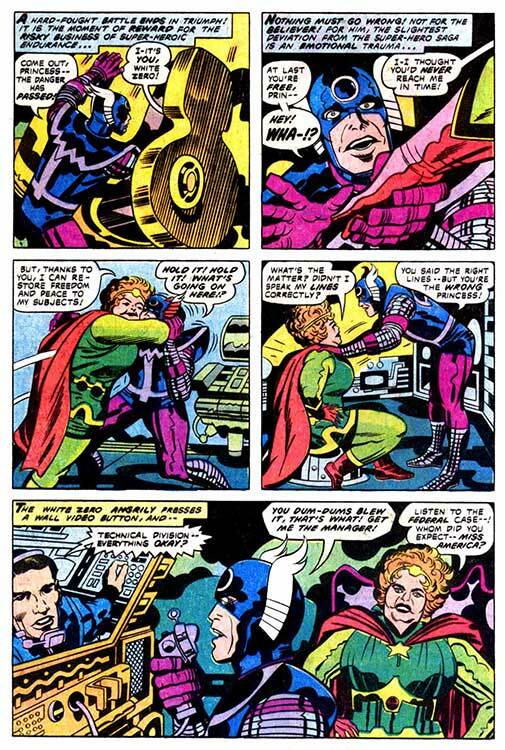 In fact, given how frequently he swooped, vulture-like, into Kirby projects that in no way required his “assistance” during this period, I’m rather surprised they didn’t. All told, then, “Even Gods Must Die!” is a thoroughly satisfying and impressive read that can hold its own with any other installment of the Fourth World saga, and offers an intriguing “what if this had been the conclusion?” possibility for fans to ponder over. It may have been “wedged in,” but you know what? It still fits into the overall tapestry damn near seamlessly regardless.